Isabella Tree’s excellent Wilding was one of the best books of 2018. It “forces us to rethink farming”. More accurately, though, it forces us to rethink – well – not farming. If you’ve been hiding under a table over the last year (understandably), Wilding is about an estate in Sussex. It’s dreadful farmland (grade 3 and 4), which has been in the same family for several hundred years. The Burrells were struggling on. They saturated their land with chemicals and lived off the State. Still they couldn’t make money. Music to Michael Gove’s ears, apparently. This is exactly the sort of thing the government is talking about post Brexit and exactly the sort of thing which featured at the recent Oxford Farming Conference. Wouldn’t it be fabulous if we could offer farmers of poor quality land – like lakeland sheep farmers – grants for public goods like this. What we’re missing, however, is that rewilding is not a very practical model for farmers who want to carry on farming. I recently visited a thriving local farm, which offered an interesting potential example of how this can be done. 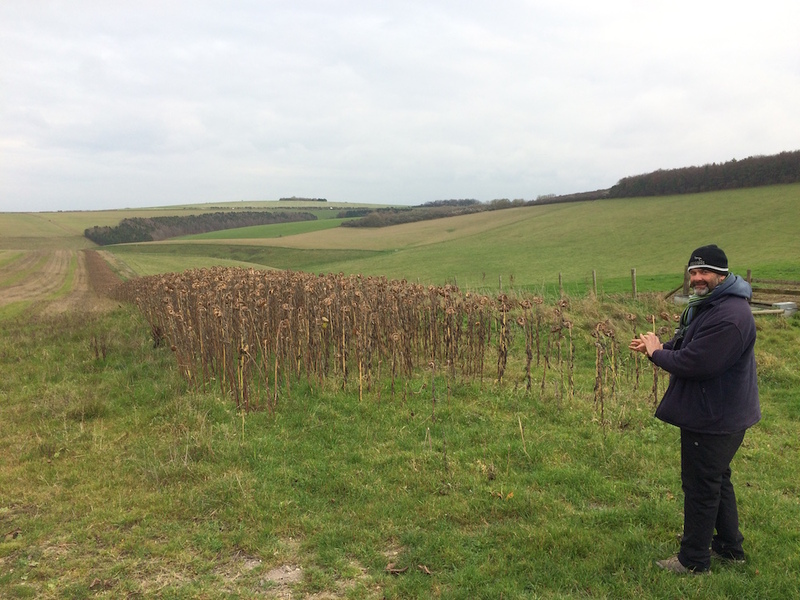 Pertwood Organics’ home is a 2,600 acre farm on the edges of Salisbury Plain. The farmland here is what the Burrells never had – high quality grade 1 and 2. It bears witness to many generations of agricultural labourers. There are Bronze Age barrows and a field system, which to my untutored eye looks early Medieval. Pertwood Farm is one of the oldest organic farms in the country, mostly arable, with some sheep and cattle. Yields are comparable to non-organic farms, input costs are, of course, much lower and their end produce fetches better prices. It sounds too good to be true, but this approach needs commitment, experienced feet on the ground and, sometimes, high tech. What’s really interesting, though, is that wildlife features large in Pertwood’s approach. The farm has a wildlife consultant, Nick Adams. Nick was at the RSPB, so he is particularly keen on his birds. There are flocks of linnets, goldfinches, starlings, etc. They were the first thing I noticed as I drove onto the farm. There are raptors too, as you’d expect: kestrels, kites, buzzards and barn owls. They have over 30 Red List species and 60 breeding species of birds on site – including apparently 5% of the entire estimated UK population of corn buntings. Invertebrate numbers are very strong too. Recent stars turns include brown argus and marsh fritillary. The obvious major gain is that the farm is organic. No chemical intervention brings surprising gains as well. I hadn’t realised, for example, how easy it was for predators to locate ground nesting birds, using the straight tracks left by spraying machinery. Pertwood use a clever cultivator to weed between wavy rows of arable crops; not only are the rows wavy, they’re also dense, drilled at very high rates. It’s impossible for weeds to establish. Foxes and badgers can’t see their prey and can’t easily get to it. The field margins along the main road next to the farm host eye-catching pollinator strips, which include phacelia, sunflowers (good for seeds too) and Cosmos; slightly weird but, hey, another potential convert to the native wildflower’s cause. They have a large scale butterfly bank, which is going nicely. 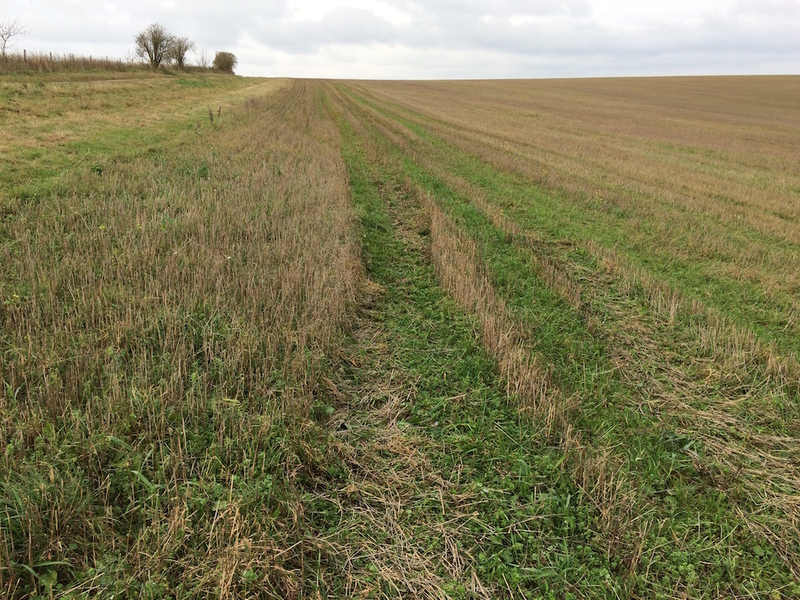 Legume leys and tussocky field margins with healthy vole populations. This is insect paradise – I hope I’ll be able to have a look around next summer. The corn buntings – along with many other birds – love the winter stubble which is deliberately left. I guess this is also good for soil structure. How difficult is this? Honestly? I have no idea – I’m not an agronomist. Maybe there is only a limited (but surely expanding) demand for organic cereals? We don’t seem to know much collectively about this sort of approach. 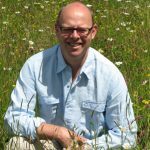 Groups like the Nature Friendly Farming Network have an exciting message, but they’re new. For too long our subsidy systems have not encouraged an environmentally friendly approach to farming. When we have tried to reward it, schemes have been woefully under-resourced. I’m not sure DEFRA or European subsidies are the complete answer. It does seem that you can farm with wildlife in mind, without not farming for wildlife. There seems to be a commercial logic to this. I’m not sure Pertwood Organics is marketed very aggressively, but they have no problem selling their muesli. I’ve mentioned the pollinator strips to many people locally, who have all noticed them as they drove by. 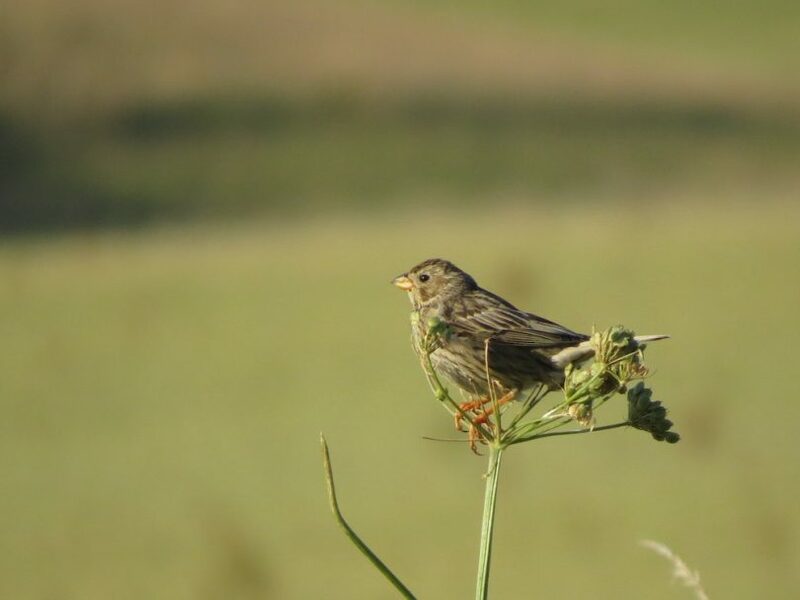 The farm’s customers love to hear about the corn buntings. Prospective customers might even read this blog. Reflecting on my visit I had conflicting emotions. I was genuinely surprised by how much a working farm had been able to do to help wildlife, while producing commercially viable crops. Fantastic. I was also surprised by what wasn’t there, though. We’ve gone through a terrible time. Despite money, skill, and commitment, Pertwood are having to fight really hard to repair the massively degraded and fragmented habitats around them. They are an oasis in the middle of a green Sahara. Where are the dormice, which would have such a lovely time on the farm? Along with other mammals and reptiles, they can’t physically get to it. I’m sure their current drive to restore hedgerows and create wildways to the farm will help, but it’s a sobering reminder of how much work needs doing. Header image credit: Nick Adams. About the Author: Nick Mann moved to Somerset in 2001. Here he was struck by the continuing loss of biodiversity in the UK and the lack of understanding of the problem and its solutions. In 2008 he set up Habitat Aid Ltd. to tackle this in a practical way. Prior to this he had spent 23 years in Financial Services, where he was mostly a specialist in the Japanese stock market, including as a founding partner of an investment firm. Nick has appeared on local radio, and writes regularly and variously in traditional and social media. He lists his interests as cricket, rugby and tennis, beekeeping, gardening and politics. He is also a trustee of the Bumblebee Conservation Trust.